Roman Polanski’s “The Ghost Writer” is a study in cinematic technique. Filmed in a stormy world with stark forms you almost feel as though the film is in black and white, though it is not. The characters are as colorless as the setting with rugged beauty and empty morals, creating a mystery of international proportions. The central character introduces himself simply as The Ghost (Ewan McGregor) when he meets the former Prime Minister of Great Britain, Adam Lang (Pierce Brosnan). Lang has been given a ten million dollar advance for his memoirs, but his previous ghost writer died before the manuscript was publishable. As the new ghost writer, The Ghost is cinematically and thematically the ghost of the perished writer who has come back to bring closure to his unexplainable death. Much of this intrigue is heightened by the relationship between Great Brittan and America that has been at the center of the Prime Minister’s career. There is additional tension when it becomes obvious that Amelia Bly (Kim Cattrall) is not only Lang’s assistant but his mistress. This gives insight into his wife Ruth’s (Olivia Williams) obvious anger and aloofness. It also explains her unfaithfulness when she chooses to commit adultery with The Ghost. Though this sexual tension and their mutual adultery could have been a cliché within a political film, it has purpose and weaves powerfully into the overall feel and theme of the film as it reveals the true nature of these characters. The question of how history will treat a person of power seems to be a preoccupation for those who seek a public life. Obsessed with what people say about them, both in the present media and in future biographies, Lang tackles this directly by wanting to write his own memoirs. With Ruth’s assistance as a Fulbright scholar and exceptional political mind, it is clear that Lang’s leadership had a questionable edge that made him an easy target. His political decisions also add realism as we contrast and compare these fictional characters with actual world leaders. 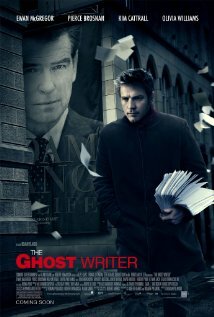 In the end “The Ghost Writer” is a film about the things that haunt us and how we deal with them. This common experience makes this an intriguing film, produced by a complex and troubled director. 1. The lack of moral people in this film leaves it a dark tale. How do you measure the moral and ethical behavior of world leaders? 2. When the truth is finally revealed only to be once more concealed, what emotion did you have? 3. If you were The Ghost what would you have written about the former Prime Minister? Posted on September 20, 2013 by Cinema In Focus and filed under 3 STARS, INTRIGUING and tagged 3 STARS INTRIGUING 2010 PG-13 RATED MYSTERY THRILLER.